Set in 50 acres of virgin Tanzanian bush in the Ngorongoro volcanic landscape, Neptune Ngorongoro Lodge all suites wood log cabin style retreat is located a few steps from the Game Reserve Gate and 20 minutes drive away from the Ngorongoro Crater, which is said to have the most dense concentration of wildlife in Africa. This all inclusive property features twenty spacious private log cabins with fire place, a restaurant, a bar and conference facilities. Indulge in moments of relaxation at the swimming pool or at the Earth & Rain Spa after a full-day game drive. 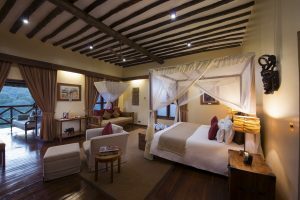 Experience Neptune Ngorongoro Lodge’s twenty luxury suites in individual cottages with open fire places in the bedroom and living room and large private viewing terraces with sofa and dining area.